Like the swallows that return to Capistrano every year, the heart of fall brings the cardinals back to my yard, and I return to my morning routine of coffee and writing at the kitchen table so I can watch as they flit from tree to tree, sometimes visiting the bird feeder outside my window, and sometimes avoiding it (likely because the smell of squirrel is too strong). I’ve always loved watching birds. I don’t mean that I sling a pair of binoculars around my neck and go tromping through fields and forests on a avian hunt, though I understand the appeal of capturing a rare moment on film. But November, always a dark for me because it’s the anniversary month of so many family deaths, is brightened by the arrival of the cardinals. First, there is the candle wreath. It’s not an Advent wreath, since it only has holders for four candles (though I sometimes place a pillar candle in the center and use it as such) but its theme is very much winter and not a specific holiday, with tiny pine trees and even tinier cardinals tucked in a wreath of greens. Since it isn’t specifically Christmas, it comes out in late November and stays until mid-February. Then the napkin rings and guest towels come out. My grandmother taught her daughters and granddaughters to decorate all through the house for holidays, so I have cardinal-themed towels in the guest bath, and I try to find cardinal-themed paper napkins for parties and casual use, as well as a couple of candles – the kind that you never actually burn – to add punches of color to the guest room, the dining room, and even my office. The last cardinals come at Christmas, in the form of stuffed birds that have wire clips so they can perch on the branches of our (plastic, pre-lit) tree. A couple of them are recent additions, but two of them are quite old, and much bedraggled. One of them bears tooth-marks – the scars from a barely-won battle against the curiosity of a puppy. Even though they’re faded and worn, however, I keep putting them on my tree, half-convinced that, in the words of the skin horse, they will Become Real. My grandmother, I am told, loved cardinals. I never knew this until I found the napkin rings I mentioned earlier. It was on a trip to Tuesday Morning with my mother, and something about them spoke to me. We don’t actually use napkin rings (or cloth napkins, though we should) with any real frequency, but I had to buy them, even if it was just to have them. 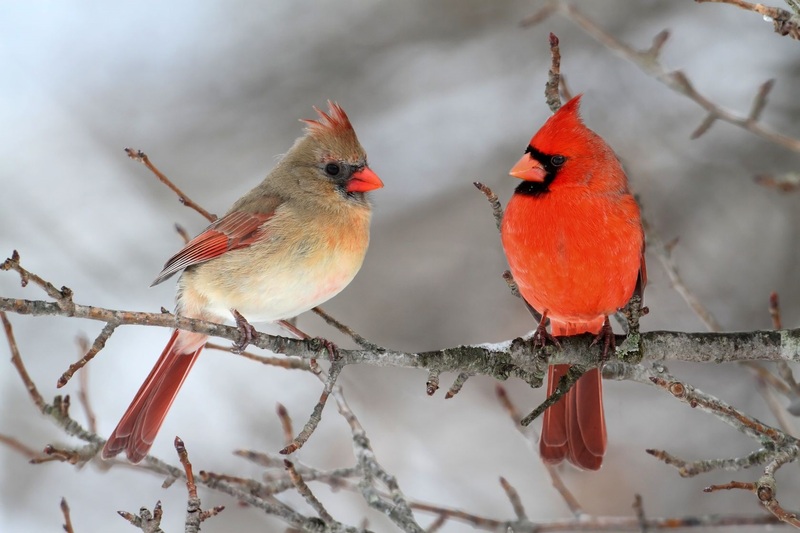 More recently, I learned that my mother-in-law also loved the bright red birds. I imagine her looking out of the farmhouse window as a young bride, and seeing a streak of scarlet adding colorful cheer to a snow-blanketed prairie, and this image, whether it’s erroneous or not, makes me smile to myself. They say that when you’re visited by cardinals you’re really being touched by the spirit of a loved one who has died. My grandmother died over a decade ago, but since there are times I swear I can smell her bath powder, or feel her cool hand soothing my brow in the middle of the night, I wouldn’t be surprised if she sent a bird or two to check up on me. My mother-in-law, on the other hand, died on the last day of August, just a couple of months ago, so maybe she’s the reason the avian family in my yard seems to have more members this year. Of course, I’m a bit premature with some of this. Thanksgiving is weeks away, and Christmas doesn’t come until fall is truly over and winter has arrived. My wreath will remain in storage for a while longer, wrapped in a festive tablecloth, nestled in a box with dessert plates shaped like leaves and a ceramic turkey gravy boat. In the meantime, I’m pouring another cup of coffee and returning to the library desk that serves as our kitchen table to write stories and watch the birds.